“ Castle Catering & Boturich Castle are one of the best in the business. Ian, Kevin and Kirsty offer a first class personal service. The level of customer service does not differ from those interested in the venue / services to those who are weeks / days away from the big day. For our wedding in June this year (2018) there was nothing more we could ask of the team. Our guests could not fault the food / service and the venue itself is hard to beat. We were lucky we ought to have a glorious sunny day that allowed us to enjoy our marriage ceremony outside with the stunning backdrop. “ Thank you so much - we had such a wonderful day and have enjoyed hearing all our guests say just how much fun they had too! Best wedding ever, apparently.......!! Everyone was praising both you & Kevin as well as the venue more generally, and specifically the food! We certainly wouldn't hesitate to recommend you or use you again the future, should the need arise! “ Ian, we can’t thank you guys enough for all you have done. Been meaning to email but things have been a tad hectic!!! All our friends and family enjoyed the day and have been commenting as it being the best wedding they have been to and a lot of that was due to how the day was managed by everyone at Boturich. Special mention to you and Kevin, and Kerry who was fantastic. Had the most perfect day and the weather was certainly on our side!!! “ Firstly, thank you so so much for everything you did for us on our wedding day. Stuart and I felt so at ease with you running the show and felt as if you went above and beyond to make sure our day was perfect. Which it was! We had the best time and so many of our guests have commented on how great you and the rest of your team were. Really couldn't have been happier with the service. “ Thank you both so much, and your catering teams, for the most wonderful day. We did have the weekend of our lives and it wouldn't have been possible without all your hard work and professionalism. So many people commented on how wonderful Kevin was and how smoothly everything ran. If we get a sunny weekend over the summer, we can pop up to the village rest and sit outside with Molly to say hello! “ Everything went well when Heather and I popped down to Boturich on Monday. Ruairidh looked after us. It was a glorious day so we sat on the decking for 10 minutes taking in the view and reflecting on all that had taken place less than the 48 hours previously. As I said in my speech, the day was “practically perfect”. We are so very grateful to you, Kevin and all the team for providing Katy & Craig with such a memorable day. We couldn’t have asked for more in terms of the personal attention to detail that we received and although we might be considered biased, given our already established view of Castle Catering, every conceivable superlative has been used when friends have been thanking us for our hospitality. Our very sincere thanks to you all for playing your part in Katy & Craig’s special day. “ We just wanted to say thank you so much for everything you, Kevin and the team did last Saturday. Everyone was raving about how good the food was, how great the venue is and how attentive all the staff were. We had a great time and would highly recommend castle catering to anyone! Will keep you in mind for future events. Thank you so much for everything on the day it was perfect, we both had the best day of our lives! “ Apologies for the late reply - we just got back from honeymoon yesterday. Thank you so much for your kind message. We had the best day ever and cannot praise yourself, Kevin and Kirsty high enough! So many of our guests commented on how great you guys were on the day at making sure things ran smoothly and how lovely and professional you all were. In the months and weeks running up to the wedding Kirsty was genuinely so helpful and nothing ever felt like it was too big an ask - despite my constant emailing. Thank you all so much for everything you all did for us - you really are absolutely amazing at what you do. If we're able to write some sort of review for you guys we'd be happy to do so, do let us know if this would be helpful. In the meantime, I've popped a link below of our 'highlights' video for our wedding that Bowery Productions, our videographer made as a wee sneak peek. It has some amazing shots of Boturich in it! “ We just wanted to give you a massive thank you for everything you did for us in the lead up to and on the wedding day. Yourself, Kevin and kirsty could not have been more helpful and put us at ease the whole time. We have had many compliments about the food, the venue and the organisation of the whole day! “ Everything was fantastic and way beyond our expectations. The Castle was gorgeous, the catering was delicious, and the staff were incredible. We can't thank you all enough for the memories which will last a lifetime. “ Apologies that we haven't been in touch just back from our honeymoon. We cannot thank yourselves enough Ian. Our wedding was everything we had ever hoped for and more. Everything from the marquee, to the food to the unbelievable service we nothing less than perfect. Kevin was a great MC and really made all our guests feel so welcome. Everyone mentioned how great he was and how effortless he made it look. Ruairidh was also great and really made us feel extra special and helped with anything from directing guests to making sure our drunken lot got home. Yourself and Kirsty were honestly marvellous, you guys made everything run so smoothly and nothing was a problem. All of our guests commented on how amazing you guys and all the staff at Boturich were and that really made our day. With 250 people, I cannot imagine it was an easy task but you guy made it seem effortless. We had guests from all over the world and they said it was the best wedding they had ever been to. If we could do it all over again tomorrow, we would. The photographer, videographer and band all said that you guys were all amazing and loved working up at Boturich also. We could not have picked a better wedding venue with such amazing staff, unbelievable food, the best scenery in Scotland and we lucked out with probably the nicest weekend of the Summer. From the organisational skills to the absolutely great banter you guys provided we cannot thank you enough. It was a real pleasure to meet you all and so happy that we got to spend our big day with such hard working nice people. I have attached a photograph from the photographer for a sneak peek, we should hopefully get all of our other ones in the next couple of weeks and will send any good ones of the venue on for you guys to use. If there is anything you ever need from us, please give us a call. Thank you again for all your help and for letting us celebrate our day in the Best Venue in Scotland and we wish you all the best success in the future. “ That's us back from our wee mini moon and we wanted to pass on our most sincere thanks to you both and to your amazing team! It's hard to know where to start, you were fantastic from start to finish. Our initial chats and follow ups were so friendly and straightforward, everything we asked for was no trouble and it made the planning stage so easy! On the run up and on the day Ian was beyond helpful and just so efficient, you pre-empted most of our questions and helped us out so much with things I'd either forgotten about or just hadn't even thought about! Our friends and family thought you were equally amazing, I'm not sure this happens with a lot of weddings but not only did they thank us for a great day they all commented on how amazing both you and all the staff were! Kevin did a great job down at the castle keeping all the ladies calm when none the coaches arrived on time and despite the hour delay caused by the traffic jams the rest of our day was not rushed at all, we got to do everything we wanted to and Kevin was so flexible with the timings it felt really relaxed. We were really well looked after all day. Next up, the food... It was delicious! Again so many happy guests, every course was perfect and the soup was heralded by anyone who had it as the best soup they've ever tasted. We were all so pleased with how much everyone enjoyed the food as it was important to us that our guests were all well fed and Castle Catering certainly pulled out all the stops. Please pass on our thanks to the chef and his team! We had the most amazing wedding day, I wish I could go back and relive each moment again. You made it all happen and we cannot thank you enough. We'd recommend you to every engaged couple if we didn't want to keep Boturich all to ourselves! Thank you from us, our families and our friends. “ Now that the dust has settled and the head has cleared I wanted to send a note of many thanks for the work you and you and your team put in to making our daughter's wedding the sublime success that it was. The plaudits have poured in from far and wide and without exception have been fulsome in their praise for the stunning location and excellent service delivered throughout the day. I know Kate and James intend to post their own testimonial now that they have returned from their short trip to Spain. “ Honestly what to say - thank you SO much for absolutely everything (there’s a wee card on the way!!) you Kevin and Pauline went beyond over and above, it was such a fantastic day and so much of that was down to you guys and all you did! All our friends and family were bowled over by Boturich and the catering and the service (a number of them mentioned they felt it was the best standard catering/event management they'd been to - and a lot of them work in events!!) We were so blessed to meet and work with you guys and we both felt one of our fave wee moments of the day was actually having a drink with you all at the end!! Would love to see you again (not quite yet for Christenings thank you ;) but are planning on coming down to the restaurant for a meal at some point so hopefully will bump into you then! Much love to you and Kevin and the team and again a massive thank you! Hope you're enjoying a slightly quieter season as well - you deserve a well-earned rest!!! “ Sorry this has taken so long. After our 3 weeks on honeymoon I needed a week to recover!!! I cannot thank you and your team enough for making our wedding PERFECT!!! From the minute we arrived at Boturich to the minute we left you were fantastic, I have never been at a wedding were things have ran so smooth (and on time)!! Every single detail was spot on and you know how fussy I can be!! The food was gorgeous as always we have had so many complements from the guests. The general consensus of our guests was that it wasn't just the wonderful venue, great food and flowing wine that made our day so amazing it was that they felt so well looked after by you, Kevin and the team. You were all so accommodating and always there when needed. Please pass on my thanks to Kevin for being my personal butler for the day, I will need to train Patrick to be so attentive!! Lots of our friends and family (even the hard to please ones, and some married ones) are saying it was the best wedding they have ever been to and it was mainly down to you guys. It really was the best day and castle catering just made it!!! I will be raving about you to anyone who will listen for the next 10 years and if your fabulous company ever needs a full time PR assistant you can give me a call. Ps.will definitely be I touch if we need to cater for anything again. “ I'd like to second Hannah's sentiment. The day was fantastic. Kevin was excellent on the day as was Erin. Point us in the direction of a place we can add a glowing review to add support as it would be great to refer another couple towards Boturich and Castle Catering as I'm sure you can repeat such a sterling Job. “ Thank you for all your hard work on our special day. The day run perfectly for us and yourself, Erin and Kevin did an amazing job! The place looked amazing and the food outstanding. We had such positive feedback from everyone. “ We really appreciate everything you, Kevin, Erin, and the rest of the team did to make it such a special day for us. We felt the day went perfectly and are both very happy. We felt all the food tasted even better than when we went for the tasting! So please pass our compliments to the chef also, it was a delicious meal and it was great for it to be served nice and hot. We found the service from all the staff to be friendly, efficient and everything we could have asked for. We will certainly keep you guys in mind for any future events we might plan, and have no trouble recommending you to our friends. Can’t believe it’s all over now, where did the time go?! “ I just wanted to drop you a note to thank Kevin, Erin and yourself together with your team for the work that you put into and delivered on our wedding day. We cannot compliment you all enough for the time that you all took to work with us, for answering our queries (of which there were plenty!) and for your support in making our day as special as it was. All of our guests have been hugely complimentary about the food that was served and the manner that your staff held themselves on the day. A huge thank you as well to Kevin for his efforts as MC on the day – I appreciate we were probably a little all over the shop in terms of timings but his advice and handling of the whole day was great. If there is anywhere that we could leave a formal testimonial for you, please let me know and we’d be glad to. “ A huge thankyou to you and your team for the wonderful meal at Katy and Matt's wedding on Saturday - everything was beautiful from the canapés to the starter, main, dessert and then the magnificent evening buffet - everyone was so complimentary. The sun shone for us which was a huge bonus and our day at Boturich will be remembered fondly by not only the bride and groom but by all of the guests as well. 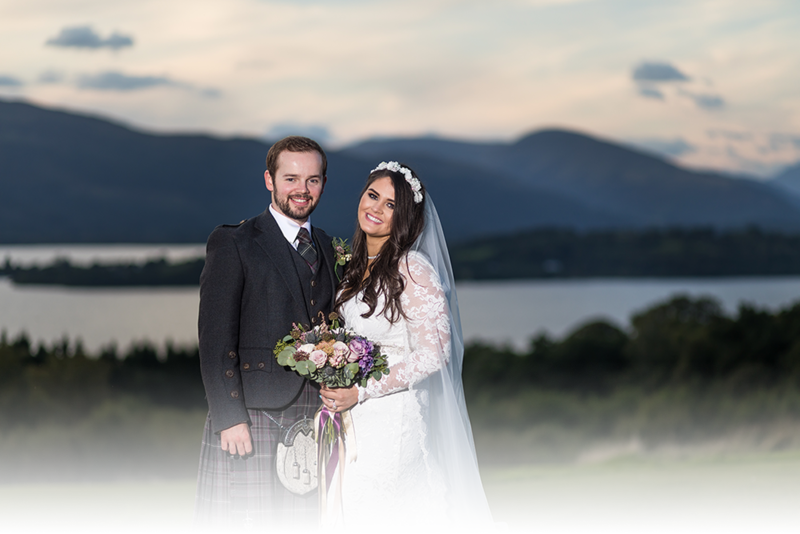 A fabulous venue for a wedding and even better when the sun shines bright on Loch Lomond! - Not always a frequent occurrence! ... I have just noticed that I didn't make mention of Kevin in my note of thanks to you yesterday - apologies for that! He was fabulous and as I said in my email to Laura if anyone is cut out for a job like that it is definitely him - absolutely charming and moving things along effortlessly all the while with a smile on his face! Please convey our thanks to him and once again good wishes for your continued success. “ just to say a big thank you for a great day. You did a great job looking after us all and providing us with a great service. Our guests were not only impressed with the venue but also with your helpful staff who were there for us right through the day. Most importantly Gillian and Mike enjoyed their day so much. “ Apologies that this comes a week late, but we have been celebrating and partying in Glasgow and Islay... In fact some of our guests rearranged their flights to stay with us longer - sign of a good party! We finally got back to Singapore last night and are about to head off on Honeymoon in a few hours’ time. We had a terrific time. Thank-you. In fact, many of our guests commented that it was the best wedding they had ever been to - even better than their own (heard that from four married couples!). The setting and service was exemplary. Thank-you! I think my parents are going to send you a note of thanks as well. They were really over the moon. Best wishes, and hoe to catch up with you again at some point next year for a dram or two. “ Thank you so much to you and Kevin! Your service was amazing and everyone commented on how smoothly everything ran! We had an absolutely amazing day and loved every second of it! It was exactly what we had hoped for and more :) thank you so much again for everything! And Kevin was so good and it just went perfect!! “ Sorry this has taken so long! Just wanted to say a massive thank you to you and all your team for making our day so special. Just wanted to say an extra special thank you to Erin for all the organising before the wedding and Kevin who I can honestly say played a part in making our day so special! From supplying us with drinks to keep us going throughout our photographs to keeping the wedding party and speeches in check lol! The food and service throughout the day was first class and even had a guest who has been to five weddings in the past year say it was the best food he has tasted. “ What can I say? We had a fantastic day and it was largely down to you all and others in the team who made it just perfect for us. You couldn't have done more to help all of us out on the day. You looked after Laura & I so well, always one of you there to assist or help out. Ok the weather eventually allowed us to have our dream wedding outside, but without all the support from you and the team, it would never have been outside at short notice no matter how sunny it was. For me it's great that we loved you but the fact our phones are buzzing all the time from our guests to comment on the service and food and how friendly all the staff were is amazing. Kevin, you are some man. When we wanted the unreasonable, you delivered it and worked out the solution. I'm not really sure how you managed it to be honest but you did. I am so glad the perfect venue has matched up with the perfect catering company to make what is only going to be a fantastic business. To me you are much more than a caterer and I truly mean that. We will be in contact after honeymoon with a more formal thank you but for now we just wanted to pass on our sincere thanks and gratitude to each and every one of you. “ Oh I just cannot thank you guys enough for Saturday! The day went by so quickly, but I just wanted to make you all aware of how important you guys are to making the day stand out, and boy do I know what I'm talking about as with my photography I've attending ALOT of weddings and just no one, no venue staff, no caterers, no hotel does what you guys do. You guys are some of the clearest memories I have of the day as you were always there making sure everything was running smoothly. I and 20 members of myself and Stuart’s closest family and friends were all back at the cottages the next day going on and on about how fantastic all you guys were. My dad now understands the difference it makes to have people like you running the day and he couldn't believe how fantastic you all were. I loved that you were all up for having a laugh with all the guests and Ian some of Stuarts best men insist you are their new best friend. It has been an absolute pleasure working with you all. Thank you so much for all your help and support over the last year or so with planning, your understanding and flexibility really helped to make our day the way we had hoped for and the team were fantastic both on the day and the prep beforehand. “ We all had a fantastic time and I do want to let you know you did a great job with the catering. I will be more than happy to recommend you to anyone needing catering services. Please also thank all your lovely staff who did a great job on the day. I would love to pop over for lunch to the restaurant. Is there a good time to catch you and Kevin? “ Thank you so much for everything you and your team did to make our special day run so smoothly. The service was impeccable and I must congratulate your staff on their great work and attentiveness. A special thank you to Kevin who was an absolute start and catered to our every need all day – very much appreciated! Dear Ian, Kevin & Erin. How do we begin to thank you for all that you did on Saturday (and Friday and Sunday!) to make it such a wonderful day for us? Your team were fabulous – efficient, unobtrusive and proactive. What more could one ask for? The food was superb, and many of the guests have remarked to me not only on the quality of it, but also that it was hot! This seems to be unusual at weddings. Lastly the wonderful Kevin- Kevin’s contribution was utterly indispensable. We have been reflecting on how well it all went- due in no small part to you and your team. You have our deepest gratitude.